If you had told me last December that in the first part of 2015, a smartwatch would make headlines across the world, shatter sales records, and create a constant stream of refreshes, hashtags and bad puns, I would have naturally assumed you were talking about Apple Watch. For the past five months we’ve been anxiously awaiting the “early 2015” debut of Apple’s first wearable, an entry so important it’s basically put its Android Wear competitors on ice as buyers wait to see what Apple Watch can really do. But while we need to wait at least another 30 days (well, maybe less) to strap one on our wrists, Pebble—humble Pebble—went ahead and one-upped Apple, LG, and anyone else planning to show off a new smartwatch at next week’s Mobile World Congress. It’s a bold, brilliant move that shifts the focus back to itself (at least until a week from Monday, anyway), and positions Pebble as a viable option in the increasingly homogenous smartwatch landscape. 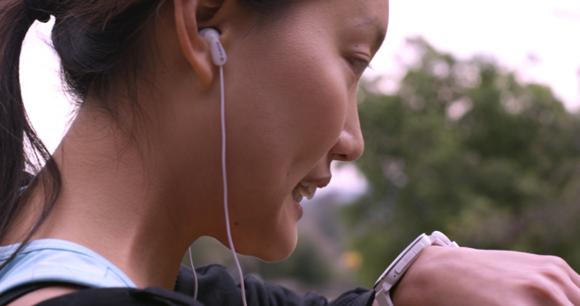 The entry-level Apple Watch Sport, right there in the center, costs twice as much as the Pebble Time, but some might consider the Time "good enough," at least until the Apple Watch's second generation. Now, it’s not likely to sway anyone willing to drop thousands on a solid-gold Apple Watch Edition, but the new Time model sets up Pebble as a formidable competitor to Apple Watch Sport, certainly more so than anything we’ve seen running Android Wear. No iPhone user in their right mind would switch to a Samsung Galaxy or Motorola X just because of a watch, but Pebble offers something few other smartwatches can claim: iOS compatibility. If Apple is the front-runner in the smartwatch race, at least where iPhone users are concerned, Pebble is the consummate underdog, going so far as to launch its new watch on Kickstarter, thus rekindling the crowdfunding credibility that made its bones. Pebble didn’t just slide in before Apple’s inevitable onslaught, it managed to capitalize on the hype with a product that’s pretty much the antithesis of Apple Watch. Stacked up against the sleek curves and sapphire glass of Apple Watch, Pebble Time probably looks like a cheap knockoff to a casual observer, but that’s not the point. Nothing about Pebble Time is luxurious. The company knows it can’t compete with Apple on the fashion front, and it’s not trying to. While last year’s Pebble Steel introduced premium materials to give the watch a more grown-up vibe, the new model goes back to its roots, sticking to its understated design (just a little thinner and sleeker) and putting a renewed emphasis on functionality. While circular smartwatches may have a certain visual appeal, Apple’s decision to make a watch with a square face has given Pebble some unintended validation, which no doubt contributed to its brisk sales over the first few days. Pebble Time can use any old 22mm pin band. You might own a few already. Like Apple Watch, Pebble Time boasts interchangeable bands, but it’s not selling a series of meticulously manufactured brackets with gold accents and magnetic Milanese mesh; rather, it gave Time a standard 22mm pin band, meaning it can be customized with little or no cost to the user. Again, Pebble’s not going to beat out Jony Ive for any design awards here, but it’s giving people a level of personalization not possible with Apple Watch. Time eliminates Pebble’s most glaring deficiency by adding a color screen, but it, too, pales in comparison to Apple Watch’s retina display. But remember: Pebble’s biggest selling point over any of its peers has always been its weeklong battery life, and the 64-color screen doesn’t sacrifice a second of it. It’s an impressive feat (even if the screen looks like something from the early ’90s), and it puts Apple Watch’s expected daily charging in a harsher light. While Pebble gave its monochrome display a necessary upgrade, however, it surprisingly didn’t add support for our fingers. That’s straight-up weird for a smartwatch, and it’s certain to turn off some buyers, but it actually makes sense for Pebble. If Time was to have a laggy or wonky touchscreen, it would be DOA. So by keeping things simple, Pebble is ensuring the best possible experience for users, with a bar far lower than the one Apple Watch has to clear. Without a touchscreen, Pebble’s navigation relies on the same four side buttons (back, up, down, select) as the original model. It might not be as striking of a navigation tool as Apple’s Digital Crown, but it’s also not as complex. Pebble’s learning curve is virtually nonexistant—it feels about as natural as a digital watch—and Time doesn’t add any unecessary complications just to compete with Apple Watch. The two watches are in different leagues for sure, but it remains to be seen just how big the market for a luxury smartwatch actually is. At $350, Apple’s cheapest watch is about twice as much as the Pebble (and that’s before we get into the potentional nose-bleed prices of the Edition). There are an awful lot of iPhone users who don’t see past the subsidized price of that device, and for them, a $179 Pebble might be the perfect smartwatch for their $199 phone. Apple has spent many months crafting an interface that’s as polished as it is professional, without trying to cram too much into a little space. 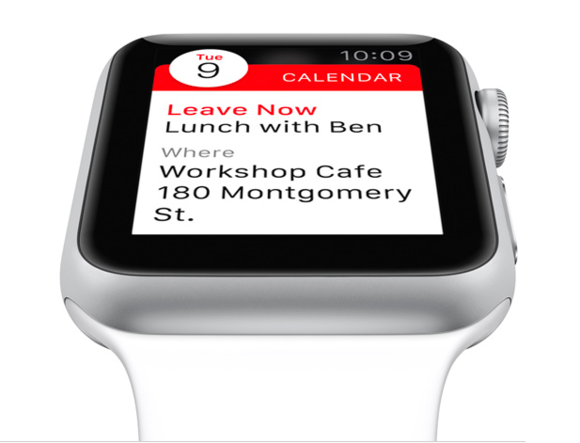 On the surface, it would seem that Apple Watch’s apps and Glances run circles around Pebble’s rather crude OS, but it’s more sophisticated than it looks. Time adds voice support, a timeline interface, and a more intuitive app menu, and is fully compatible with the 6,500-plus monochrome apps and faces already available in its app store. The three buttons on the right side of Time show you the past (notifications), present (clock), and future (upcoming appointments). While we’re all a little unsure as to exactly how Apple Watch will fit into our lives, Pebble has already sold more than a million of its smartwatches and set the standard for the kind of things we want to do on our wrists. 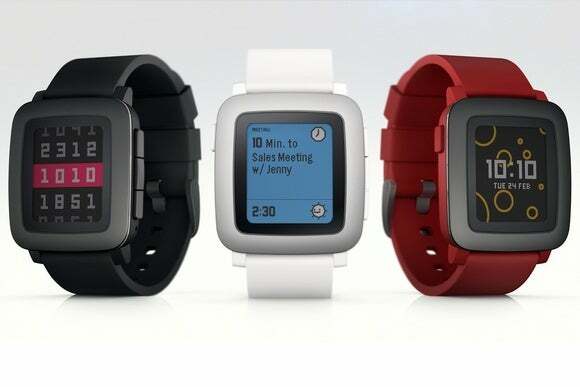 Lack of touch aside, Pebble has a stable system in place with broad developer support, and its new color model only serves to enhance the experience. It might not ever have a 12-page spread in Vogue magazine, but Pebble Time could hold its own against the Apple Watch when it comes to user experience, at least until the latter has time to mature. Of course, Pebble’s $10 million Kickstarter haul is about as much money as Apple made while you read this article, but it’s impressive nonetheless. Pebble is making a clear statement with Time: If you want Force Touch, haptic feedback and fancy navigation, buy an Apple Watch. But if you want an everyday smartwatch that pairs with your iPhone and handles notifications, give Pebble a shot. Pebble is the Casio to Apple’s Tag Heuer—it won’t turn many heads, but it could very well steal a few fence-sitters whose just can’t justify an Apple Watch purchase.